So this morning I leaned over to Brynt and said “this time next month we will be parents”. 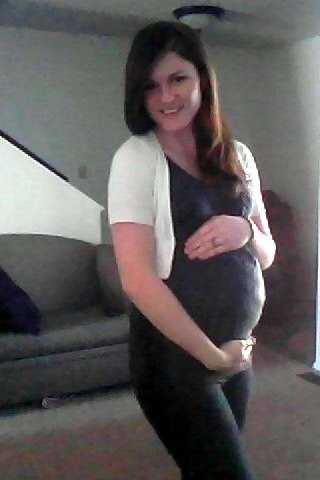 I am just about 38 weeks now so we have reached the final count down, She will be here soon! There were some ups and downs during week 36 (I blame my crazy pregnancy hormones for it). I started having mini panic attacks, freaking out that things wouldn’t get done, that I wont be able to keep up with school ( I am taking pathophysiology online this semester), that I don’t know enough about having a new born………the list goes on and on. After a few small melt downs, and lots of loving hugs from my sweet husband, I am now feeling much better. Today I feel so blessed and excited, I know she will be here soon and I can’t wait. I am so excited to see what she looks like, what she acts like, I want to hold and get to know who this little person is! I know that things are going change greatly, and I can’t wait. I can’t wait to meet my little Camberlyn!